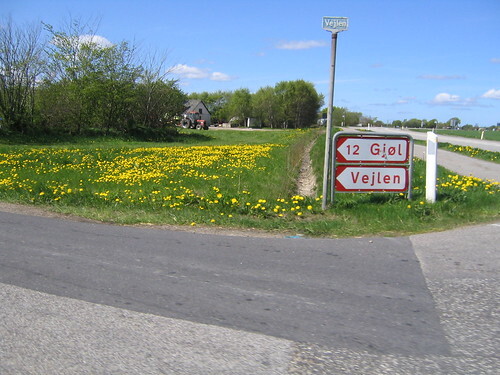 Intersection in a rural area of Northern Denmark. The fully separated bike lane next to the road, typical for areas like this, is visible on the right of the photo. A travel writer friend of mine, Tom Hall, has posted his account of his cycling tour of northern Denmark on his blog. Cycling in Denmark - Aalborg to Skagen. Fits well with the recent post about the national cycling routes and downloadable maps and all that. "The result served as the blueprint for our own National Cycle Network – and is a boon for holidaymakers. It only goes wrong when you ignore it and attempt to build your own route visiting nearby places with silly-sounding names like Pajhede Skov and Uggerby. I learnt this to my cost mid-morning, when pondering that the bloke I was passing on my left hitting golf balls looked just like the bloke I’d passed twenty minutes ago on my right. He was the same chap. Lesson learnt: stick to the signed route. Chastened, I returned to route 3 and, turning back into a London cyclist, started chasing the only other riders I saw all day. They seemed to be wearing their Sunday best and riding bikes straight out of Last of the Summer Wine. I expected to catch them quickly. They disappeared over the next hill and I didn’t see them again." It's a cracking travel article and almost makes me want to visit the provinces this summer. Almost. Alas, a decent café latte is hard to find. But definately a good read about cycling holidays in Denmark.